Part Time: Receptionist and Administrative Assistant | Upper Peninsula of Michigan Radio - Yooper News, Interviews, Pictures, and Calendar of Events - Great Lakes Radio, Inc.
20 hours per week on weekdays between 8:30 am to 5pm. Other hours and duties assisting various departments may be required, especially during contest and giveaways. This position may offer more hours in other areas for those with writing, web, and eBay experience. $9.25 per hour, but compensation is commensurate with experience. We are seeking a highly organized multi-tasker to professionally answer phones, do typical administrative tasks, run a cash register for our Shopping Show, provide sales support, promotional support, maintain newsletter, write promotional messages & scripts, write and perhaps record on-air promotional scripts for Items-of-the-Day and specials, run fax machine, complete daily reconciliation report, do daily backups, run front desk & reception. Quick mastery of phone/fax/email and other office systems is a must. A variety of other tasks and duties may be required as directed by management. General office skills required include but are not limited to: reception and cash register usage, fax machine (incoming & outgoing), cash management from shopping show sales, sale support, completing reports, filing and organizational skills, excellent computer skills with experience using spreadsheets, Microsoft or Open Office productively programs, decent typing speed and accuracy, excellent writing and editing skills for online posts, email & newsletter, simple presentations skill, proposal editing, promotional script writing from time-to-time, e-mail, internet account management, detail-oriented policy adherence, and communications and writing skills focused on promotional and marketing success. In addition to usual in house cash register sales and upsells, candidate should be comfortable with online activities, including but not limited to online sales (eBay, Craigslist, PayPal etc), and social networking (Facebook, Twitter, etc.) is a big plus. A flexible mind, honesty, attention to details, great attitude, positive interaction with customers and clients and salespeople are the most important qualities for the successful candidate. Willing and able to learn new skills, apply them successfully, and work in a highly challenging, multitasking environment are also extremely important qualities the successful candidate will possess. Great Lakes Radio provides employees with many opportunities for growth in different areas within the company. Based on your experiences and interest, you may be able to pick up more hours in other departments to achieve more work hours. Great Lakes Radio, Inc. is an Equal Opportunity Employer. Please send your resume and writing samples to employment@broadcasteverywhere.com or Employment, C/O Great Lakes Radio, Inc. 3060 U.S. 41 West, Marquette, MI 49855. All qualified persons have equal opportunities in positions at our company, including but not limited to equal opportunity for recruitment, selection, appointment, promotion, training, discipline and treatment. 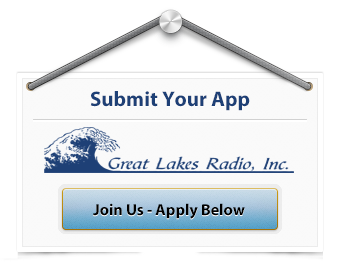 Great Lakes Radio, Inc. is an Equal Employment Opportunity (EEO).